466 pages | 316 B/W Illus. Now in its Third Edition, Alternative Energy Systems: Design and Analysis with Induction Generators has been renamed Modeling and Analysis with Induction Generators to convey the book’s primary objective—to present the fundamentals of and latest advances in the modeling and analysis of induction generators. 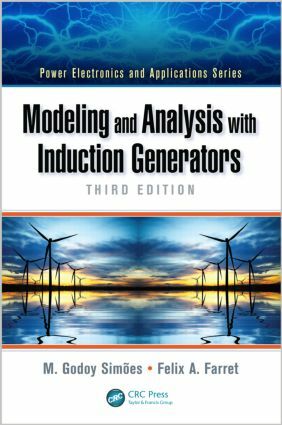 Modeling and Analysis with Induction Generators, Third Edition aids in understanding the process of self-excitation, numerical analysis of stand-alone and multiple induction generators, requirements for optimized laboratory experimentation, application of modern vector control, optimization of power transference, use of doubly fed induction generators, computer-based simulations, and social and economic impacts. "I have taught courses on renewable energy systems and induction machines, but I have never combined both of them together before. This book has shown me a new way of thinking. … The language and the examples are very accessible and intuitive. This book is ideal for a first read, an exam study, or a broad literature review." "To my knowledge, this is the only book devoted entirely to the induction generator, which would be sufficient reason to make it important for the international community of electrical and electronics engineers. … The text is very didactic, being suitable to be used as a textbook in engineering schools, but also appropriate for consultation and self-education. There are a large number of solved problems, and also proposed problems, which serve as additional study tools for students. [The text] makes use of modern mathematical and computational tools used in the modeling, analysis, and simulation of power generation systems with induction generators. … Following the examples of previous editions, the text is well planned, with sense of proportion between the various chapters. The main aspects of the induction generator [are covered], including constructive aspects, self-excitation, steady state analysis, transient analysis, scalar control, vector control, control-oriented modeling, simulation, and practical applications in renewable and alternative electric power generation. The text is clear and easy to follow and understand. The authors, both experienced instructors and researchers, have used all their didactic skills to approach the subjects, even those subjects usually considered complex, for the benefit of the readers, mainly graduate and undergraduate students of electrical engineering." "The text is easy to read and the figures are clear and comprehensive. The explanations are easy to follow and complete. The references to previous works are numerous and wide." Why Optimize Induction Generator–Based Renewable Energy Systems? M. Godoy Simões holds a B.Sc, M.Sc, and D.Sc (Livre-Docência) from the University of São Paulo, Brazil, and a Ph.D from the University of Tennessee, Knoxville, USA. An IEEE senior member, Dr. Simões currently works at the Colorado School of Mines, Golden, USA, and is director of the Center for Advanced Control of Energy and Power Systems. Widely published and highly decorated, he was recently awarded a Fulbright Fellowship to conduct research and educational activities at the University of Aalborg, Denmark. Previously, Dr. Simões was a faculty member at the University of São Paulo. Felix A. Farret received bachelor’s and master’s degrees in electrical engineering from the Federal University of Santa Maria (UFSM), Brazil. He specialized in electronic instrumentation at Osaka Prefectural Industrial Research Institute, Japan; earned an M.Sc from the University of Manchester, UK; received a Ph.D from the University of London, UK; and did a postdoctoral program at the Colorado School of Mines, Golden, USA. Widely published, he is currently a professor at UFSM. Previously, he worked as an engineer at the State Electric Power Company, Rio Grande do Sul, Brazil, and was visiting professor at the Colorado School of Mines.